The Internet has become a great source of information, research, education and entertainment in our life. Children age preschool are already learning to use the computer and surf the net. As parents we should be protecting our children in all environments. 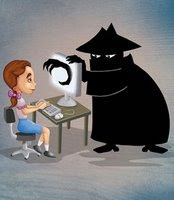 Although you do not want to scare children when we talk about the dangers of Internet predators, you need to teach them to protect themselves in any environment in real life or on the network. The reality is that the Internet is completely Anonymous. Children are naive by nature and they can easily fall prey to a predator in online posing as a child. Protect your child from online predators is an issue that should not be taken lightly. About one in three children said that has received a message online or photo that makes you uncomfortable. Very few tell their parents. Technology is constantly changing and any part of the Internet that allows people to exchange messages can be used by someone who is trying to exploit your child. Talk openly with your child about dangers of the Internet and spend time together with them in line. Remind them never give information or post pictures of themselves online. What’s more can you do to protect your child online predators? • Be educated computer and be aware of Internet. Find out which places you like to look at your child and review them often for inappropriate content. Make sure you have your child’s password E-mail and any communities line. Discourage or limit the use of webcams or mobile video devices. • Ask your Internet service provider for the authority that allow parents to block access to adult sites, chat rooms and bulletin boards. A variety of programs allow you to restrict who send an email to your child and what types of visited sites. • Establish guidelines and discuss with your child to Internet security search. Give participation in the discussion. Have your child sign a agreement “safe navigation” that you have reminds them of the rules of being on the Internet. Encourage them to use sites to find more children or configure your browser to remove inappropriate Content. • Keep the computer in an area of ​​high use of your home and outside your child’s room. Control other Internet access points, mobile phone including the iPhone, portable devices and PDAs. This will help you be aware of the Internet habits of your child. • Teach your child safe behavior in Internet (what types of information are safe for share, recognize inappropriate behavior, etc.) Remind them to think before put or share information online. Nothing really private on the internet for private information can be easily disseminated. • Let your children know they can come to you if they receive messages that make them feel uncomfortable. Help them understand that not everything they read online is true and that people in the Internet could be different from what they seem to be. • Contact the police if someone online ask your child in any way. Remember that the Internet is like being in a public place. You should be aware of the safety of your children and protect them from dangerous situations. Who can see the information of your child. reminds them of the rules of being on the Internet. use of your home and outside your child’s room. aware of the Internet habits of your child. private information can be easily disseminated. the Internet could be different from what they seem. that the Internet is like being in a public place. children and protect them from dangerous situations.